Parking for the U-M Comprehensive Cancer Center is in parking structure P1. If you have an appointment at a clinic located in the Taubman Center, please note that you will want to follow signs to the Taubman Center parking structure P2, further along East Medical Center Drive. Exit parking structure P1 on the 1st floor to enter the Cancer Center Building. When you enter the building you will be on Floor B2. The Information and Registration Desk is directly in front of you as you walk in the door. Please stop and receive your "blue hospital card" or you may update your registration information before you proceed to your destination. 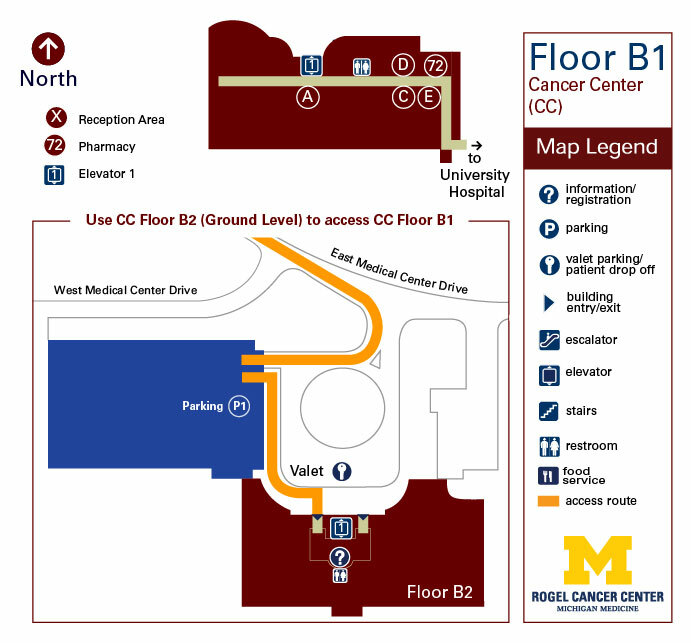 *Detailed directions to services located on Floor B1 of the U-M Comprehensive Cancer Center are listed below. Look for signage to assist you in finding your location. Take the elevator Floor B1. When you exit the elevator turn to your right. Take the elevator to Floor B1. When you exit the elevator turn to your left. Reception D is near the end of the hall, on your left. Take the elevator to Floor B1. When you exit the elevator turn to your left, follow the hall to the end and the Pharmacy will be on your left, across from Reception C.
Take the elevator to Floor B1. When you exit the elevators turn to your left. At the end of the hall, on your right, is Reception C and Reception E.. The Voices Art Gallery showcases artwork by Cancer Center patients, family members, staff -- anyone impacted by a cancer diagnosis. Take the elevator to Floor B1. When you exit the elevators turn to your left. At the end of the hall, PAST Reception C, is the Voices Art Gallery.